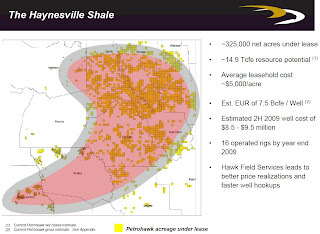 I spent some more time with the Petrohawk investor materials today (earlier I reported results from the company's earnings release) and noted a few more interesting bits regarding the Haynesville Shale. First, the company bragged on its data mining and analysis and said that it is looking at the "Central East Texas" area around Nacadoches and Shelby Counties for additional Haynesville acreage. The company is leasing land there and elsewhere in northwest Louisiana to fill in gaps. Petrohawk described the leasing activity as "intense" but noted that it "pales in comparison to the land grab of 2008." The slide below shows this trajectory towards the west. Coincidentally, Petrohawk's take on the shape of the de-risked area looks like an upside down version of the company's logo. Maybe that's why they like the Haynesville Play so much. The company also noted that it has been reporting initial production rates based on 24 hour results. Now that Petrohawk has built a stable of wells over a longer period of time, it feels comfortable reporting aggregate initial results on a 30 day basis. For the company's 38 wells that are mechanically sound, the IP rate for the first 30 days is 14.2 MMcf/day. 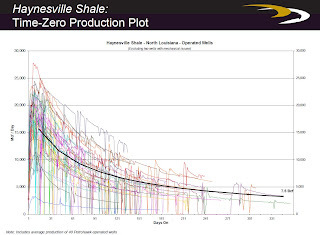 Below is a time zero plot of forty of the company's first 44 wells showing decline rates and production. Looking at these curves, the company has determined that a 7.5 Bcf EUR (estimated ultimate recovery) is appropriate. This EUR is higher than many other companies in the play use. Sample 4 #2 (serial #238828), Sec. 4, Township 14, Range 11: this well has been producing since March 2009 and has already produced 2.3 Bcf, which equates to 13 MMcf/day. Petrohawk estimates a EUR in the 13 to 15 Bcf range. Matthews ETAL 17H #1 (serial #239157), S17/T13/R11: this well has been on a restricted choke of 14/64" but flow rate and pressure have increased to the point where it was producing 8.9 MMcf/day at 9,035 lbs flowing casing pressure on the reduced choke. 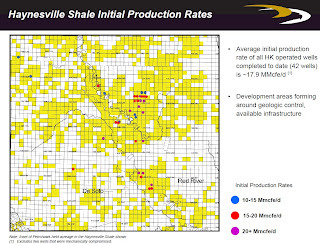 Petrohawk intends to keep this well on a restricted choke to test decline rates versus other area wells with more open chokes to see if it wants to apply this technique to other wells. Below is a chart of Petrohawk's holdings and a summary of IP rates it has seen on its leases. Petrohawk is currently running 12 rigs in the Haynesville Shale, but it expects to increase this number to 16 by October. The black line on the decline chart that is supposed to show an average is just drawn on. It intersects lines above it. Shady.